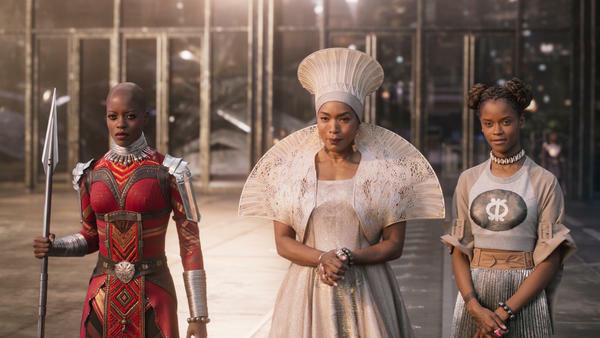 Florence Kasumba (left), Angela Bassett and Leititia Wright appear in a scene from Marvel's Black Panther. Sociologist Darnell Hunt says the film's success "demonstrates what's possible beyond standard Hollywood practices." Hunt says Black Panther, for example, "smashed all of the Hollywood myths that you can't have a black lead, that you can't have a predominantly black cast and [have] the film do well. It's an example of what can be done if the industry is true to the nature of the market. But it's too early to tell if Black Panther will change business practices or it's an outlier. We argue it demonstrates what's possible beyond standard Hollywood practices." The fifth annual diversity report is subtitled, "Five Years of Progress and Missed Opportunities," suggesting that America's increasingly diverse audience prefers diverse film and television content. The study reports that people of color bought the majority of movie tickets for the five of the top 10 films in 2016, and television shows with diverse casts did well in both ratings and social media. Hunt's team crunched the numbers for Hollywood's top 200 films and 100 TV shows from 2015 to 2016. What they found, according to Hunt, was a "mixed bag" that over time shows a pattern: "Two steps ahead, one step back. But at the end of five years, we see there's not much progress." Hunt says there are a few bright spots in television: Broadcast TV and children's series are increasingly diverse and do well in the ratings. "Most babies born in America today are not white," Hunt notes, "so if you look at children's programming, it's unmistakable that you must have diversity, otherwise the show fails." The box office success of "Black Panther" is no surprise to UCLA sociologist Darnell Hunt. His annual report on Hollywood diversity is out today, and it shows that diverse casts and creators are just good business. Here's NPR's Mandalit del Barco. MANDALIT DEL BARCO, BYLINE: Darnell Hunt says "Black Panther" has smashed the old myth that films with black actors don't do well. DARNELL HUNT: It's an example of what can be done if the industry is true to the nature of the market. That is to say, America's about 40 percent people of color now, and it's becoming a half a percent more diverse every year. And that tracks onto what's happening around the globe. So if Hollywood positioned itself to take advantage of those demographic realities, box office numbers are going to increase and the industry as a whole is going to flourish. DEL BARCO: Hunt says it's too soon to tell if "Black Panther" will change industry practices or if it's an outlier, like the Oscar-winning film "12 Years A Slave" was. Hunt's team at UCLA found that people of color bought the majority of movie tickets for five of the top 10 films in 2016. Television shows with diverse casts also did well in both ratings and social media during the 2015-'16 seasons. Hunt's team has been crunching the Hollywood numbers every year since 2011. Their latest annual report is subtitled, "Five Years Of Progress And Missed Opportunities." They found people of color remained underrepresented as film leads, directors and writers. The same for broadcast, scripted and reality TV series on cable and digital, too. They found that African-Americans fared better than Asian-Americans and Latinos and Native Americans, who are nearly invisible on the big and small screens. And, despite making up more than half the population, women also remain underrepresented, especially as film directors, where they're outnumbered 7 to 1. DEL BARCO: Hunt says there are a few bright spots. Broadcast television, with shows like "Empire," and "The Walking Dead" and children's TV series that reflect today's demographics. HUNT: Most babies born in America today are not white. So if you look at children's programming, it's unmistakable that you must have diversity. Otherwise, the show fails. It's simple as that. DEL BARCO: Hunt says Hollywood needs to get its act together for people of color and women if for no other reason than the bottom line. Mandalit del Barco, NPR News. Transcript provided by NPR, Copyright NPR.